FOCUS TRANSPORT: Go Ahead to Take Chambers of Bures in Suffolk? H.C.Chambers of Bures in Suffolk to become part of the Go-Ahead Group? Bures-based H.C. Chambers & Sons Ltd, which runs regular services in west Suffolk and Essex and also specialises in transport for people with disabilities, is likely to be purchased by Go-Ahead. In March, Go-Ahead took over another local firm, Hedingham Omnibuses, which now operates out of Colchester. Martin Dean, managing director of Go-Ahead, confirmed that the company was in consultation with Chambers over the proposed deal and that current drivers had been informed by letter about the possibility of the takeover, as part of the consultation. He did not want to comment officially, as the deal has not yet been agreed. Chambers has been owned by the same company since it started with horse-drawn buses and carts more than 140 years ago. From the early 1970s, the company concentrated on its Bury St Edmunds to Colchester service, which is one of the longest-running bus routes operated by an independent company in the UK. 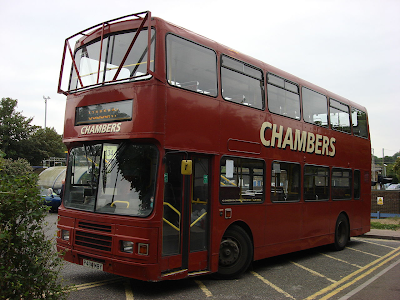 Chambers also runs regular Sudbury to Colchester and Clare to Bury St Edmunds services. It is believed that the company’s headquarters may be moved to Chilton Industrial Estate in Sudbury and their current site in Bures High Street could be redeveloped.